Many casino players are very fond of the games where they can apply some skills to increase their edge. Thus, one of player's favorites in a gaming site is poker, which is a card game that highly involves different strategies to win. Among the plenty variants of poker, video poker is one of the most played because of its fun nature. Players may enjoy seeing the cards unfold even at the comfort of their homes. When picking the right video poker game, there are several factors to consider. First is the potential payout. Players should check the odds as there are games with better offerings. In addition, bonuses present in the gaming site should also be considered by the players. 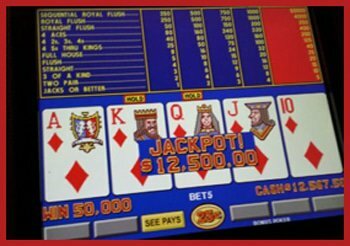 Contrary to common belief that casino games have higher house edge, video poker has an impressive payout for the players. In fact, there are variants that can even give players up to 100% payout in the long run. Some lucky players can even find video poker games with payout higher than a hundred percent such as Double Bonus and Full Pay Deuces Wild. Jacks or Better, which is a popular variant of video poker, rewards the players up to 99.50% payout. New players of this casino game may also be rewarded with such high payout because the house edge is very low. To get the most out of it, players are advised to look for Jacks or Better with 9/6 odds. This type of video poker lets the players get 9 times of their bet for a full house hand, or 6 times of their bet for a flush. Players can easily check the pay table of the game to determine its odds. Another recommended video poker is the Deuces Wild that allows players to enjoy 99.7% payout. The best Deuces Wild can give players an odd of 15/9. Players who will get five of a kind hand will be given 15 times their bet. Meanwhile, players who will get a straight flush hand will be rewarded with 9 times their bet. Players aiming for a higher reward can check out the Full Pay Deuces Wild. In this game with 100.76% payout, four Deuces can act as wild cards. The Double Bonus poker has also a whopping 100.17% payout. Fans of this game will surely enjoy the 10/7 odds for full house and flush hands respectively. Although there is no wild card available in Double Bonus, players will still be pleased with the generous winnings from getting certain hand in a game. There are numerous gaming sites that offer video poker games, but these gaming sites are not created equal. Players can have the best poker experience only in the best casinos. 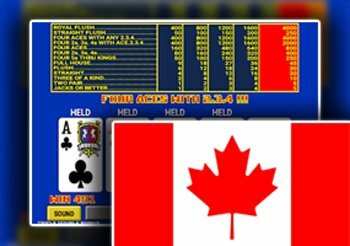 To guide players in choosing the recommended gaming sites, we have reviewed the top places where Canadian players can indulge in video poker. Canadian players may try the video poker games offered by Spin Palace Casino. This gaming site is one of the favorites in Canada because of its high payout and compatibility with most mobile devices. Another must-try gaming site for video poker is the Jackpot City that can offer up to 1,600 Canadian dollars for bonus. Ruby Fortune and Betway Casino are also recommended because of their good reputations in the gaming industry. Players will surely get a great video poker experience in these gaming sites. Aside from the online casinos mentioned above, there are still many other gaming sites where Canadian players can indulge. Just make sure to check some factors indicating a good gaming site for video poker. A little research on the background of the casino and its reputation will definitely help players gauge whether it is the right place to play. Mechanics of a video poker is similar with its land-based counterpart. Rules of the game may vary depending on the variant of poker being played. However, the most common video poker game involves five cards. Players will then decide which card to keep and discard to aim the best hand. Players may raise their bet or fold their hands depending on the card's value. The player's main goal in this game is to have the highest hand among the other players. The value of a player's hand defines his or her luck in the game. Thus, it is very important to know the hand rankings. The highest hand rank among all the card combinations in video poker is the royal flush. It is composed of 10, Jack, Queen, King, and Ace of the same suit. Next to the royal flush is the straight flush hand, which consists of five consecutive cards of the same suit. Four of a kind comes next to straight flush. As the name suggests, this hand is composed of four cards of the same value. When there are two players with four of a kind hand, the one with the higher value will win. After four of a kind is the full house, which consists of three cards of the same value and one pair. Flush is a hand consisting of any five cards from the same suit. Flush beats straight hand, which consists of five consecutive cards of different suits. Next is the three of a kind with three cards of the same value, wherein the two other cards with different values. Last on the list is two pair, which is basically a hand with two pairs of similar cards. In a game where there is no winning hand, the hand with the highest card value will win the game. Understanding the video poker hand rankings will absolutely help the players to strategize their move and get some edge in the game.